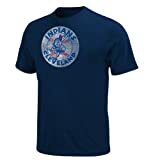 Round the bases all year long Cleveland Indians fans, in this t-shirt by Majestic. Featuring a retro screen printed design, this t-shirt will surely have fans talking. Designed to display your teams color scheme, and provide a comfortable fit. This entry was posted on March 24, 2012 at 3:51 am and is filed under Cleveland Indians. You can follow any responses to this entry through the RSS 2.0 feed.